Starting to work at a new office can be very exciting and intimidating at the same time. Along with meeting new people at the office, you will be busy with understanding and adapting the new corporate culture and finding ways to excel in your new gig. It doesn’t matter if you are on your fifth career change or fresh out of college, all become anxious when it comes to making friends at a new office. At times you hit right off and people accept you with open arms and there are friends who stay forever even in cases where you leave that job. It is obvious that you are nervous, but do not make it obvious for the people who are looking at you at your new office. Keep a smile and try to maintain a good mood. Look lively, attentive and excited so that people feel comfortable to connect with you. This step can seem like a common sense, but in a new environment even the most social person can clam up. Gradually say hello to the people in your immediate work area and then greet the other people around the office. It is not necessary that your introduction process be completed with everyone, the moment you decided to introduce yourself. You might come across people who are very busy and so it will be appropriate to not disturb them and look for other best time they will be free. First impression always lasts and so later when you approach that particular person mention that they were busy earlier and you did not wish to disturb them. You will look considerate towards others. A secret to strike up a conversation with any person, be it your coworker or senior, is to ask them questions that are open-ended, about themselves. Ask your colleague where he or she got their hair done or from where they bought their remarkable jacket etc. Become honestly interested in his or her hobbies or life apart from work. It is important to memorize a few details they share to help you for future conversations with them. To remember what others are saying you need to pay attention on what the other person is saying. Do not make building friendship just about you by speaking only about yourself and sharing details about your own life. Dig into their life and make the conversation about them, so that they feel you are genuinely interested and listen to what they have to say. Ask keen and genuine questions. When asked, let the other person know about you too. When you seem interested in your coworker’s life they will mandatorily or interestingly ask about you. Do not shy away or refuse to open up. Friendships are built with two way conversations and as you are taking in information about them let them have some about you. It doesn’t mean you have to tell them every single thing; some things must stay off limits. Try to become someone who you would wish to be friends with. It doesn’t mean you have to be cheerful at all times, but you must try not to be mean or arrogant to anyone. For instance, if you have not slept well and feel a bit grumpy, ask yourself whether you want to hang out with yourself in such a mood. When you think the answer is no, it is the same feeling your coworkers must be having. Once people in your office have got to know you and a relationship is established, try to kick it up a notch. Invite them for watching an upcoming movie of mutually interested genre or checking out a new café or restaurant that has opened near your new office. It is a great way to know more about each other in a new perspective when you take things outside the premises of the office. When you get in to a new office, there is always a person who will be happy to help and would tell you to ask them for help if you need. In such a scenario, take their word and ask them for a quick tour of the office. In case the firm is small, you can ask them to introduce you to people by taking you around. Perhaps you will not remember all that you see and all the names of the people you meet, however you will pass the initial introduction through this. It is natural to fret about taking things to the next level and the transition of relationship from work friends to real life buddies. However it is possible to make a more subtle approach. The next time your coworker brings up the topic of a movie or talks about going for shopping after work, suggest casually that you both go for it together. If they seem keen and offer to plan things up, it sets everything right in place easily and you will find your true after work mate. Sometimes the work environment can be very cold. It may be difficult to break the ice with anyone, no matter how hard you try to speak to people; they might just not open up. However if you find a person who is as clueless as you, chances are he or she is new at your office too and you can try to be friends with this person. It is easier to make friends with someone when they share the similar circumstances like you. You must observe the time when the people in the office arrive and leave, dress code, lunch habits, after work traditions on Friday, do people greet each other each day, or are they indifferent to each other etc. The key to connect and fit into a new office is to get the gist of how things work in the office. Taking initiatives can be hard when people are difficult to try to connect with in your office during lunch. Thus you can ask a coworker to meet you for coffee before work. The casual coffee dates are quick and perfect for connecting with new coworker. It is not that expensive and not time consuming as well. When you start a new job, it’s quite easy to spend all day at your own desk; however mingling with your colleagues can make work simpler and enjoyable. So often make efforts to move from your own desk and walk over to the water cooler and greet the people along the way or at the cooler. There may be people who are involved in gossiping and bad mouthing about each other. Be aware when someone like this approaches and gossips about another. You do not need to dwell on what they say have to say, just to be friends with them, but keep an open mind. You will eventually get to know more about all the people in the office and make your own decision about being friends with those that are suitable with your personality and who are true and trustworthy. Share particular experiences related to work or some other personal ones that you know can trigger a good conversation between you and your colleagues and will lead to establishing friendship. When people spot similar experiences or common interests they become fascinated about the other person and a bond is established between them. Social media profiles are a better way to know about a person in their personal lives and hence ask people if you can add them and if they can add you on social networking sites. The connecting and sharing will continue even after work. When you know or get to know that the next day is going to be your coworker’s birthday, put some efforts in doing a little something special like gifting them something useful that they must have mentioned in earlier conversations to you or a simple birthday greeting card will suffice. This sends out a clear and welcoming message to them that you intend to be friends with them. If you have come across knowing that your coworker is fond of something like donuts or other such delicacies, make efforts to get it for them. All love a person who gets sweets or yummy treats to office. Homemade cookies or pastries are undeniably wonderful to offer to another person and is a good conversation starter. Do not back from sharing your recipes if your treats are homemade. You just have to remember to relax and not stress over whether you are making friends or not. A new environment is always difficult to make friends in and a new workplace is definitely a hard one. Give things time to settle and relax as you wait, as relaxing is the best thing you can do to yourself for having a more approachable and likable personality. 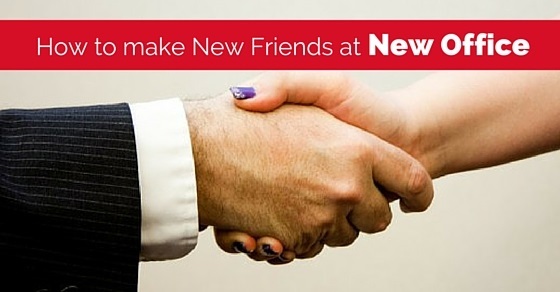 Gradually carry out the above tips for making friends in a new office.